Below is my completed EQ AMP project which was housed in a MFJ mic / tnc switch box, the push button switches the circuit in or out. Since then I have reinstalled it in a different enclosure allowing me additional room for future advancements. Completed view of the EQAMP. Click here for sample sound file. 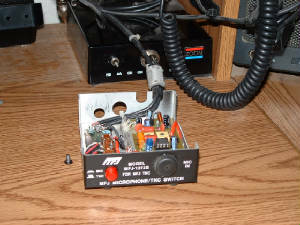 Above is my Eqamp that I built in a MFJ mic tnc switch housing it certainly does work well on hf,vhf. I hope that you enjoy building your project as it will improve your transmitted audio when it's all completed. Thankyou for visiting my web pages and have fun....Good Luck es 73 de Clint VK2ACM.